Barbara Hepworth’s development of the figure in landscape theme to which she turned increasingly after moving to St Ives in 1939 is considered in relation to the phenomenological philosophy of Maurice Merleau-Ponty and, in particular, to notions of embodied experience and interconnectivity. Our constant aim is to elucidate the primary function whereby we bring into existence, for ourselves, or take a hold upon, space,& the object or the instrument, and to describe the body as the place where this appropriation occurs. I rarely draw what I see – I draw what I feel in my body. Despite these assertions, however, few publications have sufficiently analysed Hepworth’s particular use and development of the figure in landscape theme. This observation was first made by the curator Penelope Curtis in her article ‘The Landscape of Barbara Hepworth’ (1998), which began, ‘Landscape tends to be an obstacle in seeing Barbara Hepworth’s sculpture … The analogy has been used so frequently, and with so little care, that it is, at best, a cliché’.7 Seeking to account for this obstacle, Curtis offered two explanations. First, she suggested that there was a belated attempt on the part of art historians ‘to position Hepworth among the British Neo-Romantics who returned to the English landscape after the war’.8 Secondly, Curtis observed that critics have been ‘at a loss to codify her post-war work’ and ‘resort[ed] to the landscape as a useful bit of shorthand’.9 While acknowledging the difficulties encountered historically by critics seeking to analyse Hepworth’s engagement with the landscape, Curtis’s own investigations point towards a consideration of the physical and active nature of Hepworth’s experience of the landscape and of the viewer’s engagement with her works. For example, in her article she discussed Hepworth’s desire to make her mark on the landscape and to show works within a natural context.10 She also highlighted a quotation in which Hepworth emphasised the role of the viewer’s physical journey towards sculpture; to her friend the critic Herbert Read Hepworth wrote: ‘Imagine the critic having to climb a hill, or walk a mile through a forest … to see a sculpture.’11 These glimpses into Hepworth’s engagement with the physical experience of landscape and sculpture suggest that the theoretical discourse of phenomenology might assist in responding to important questions. How do Hepworth’s sculptures represent the figure, the landscape, or both together? And how do Hepworth’s ideas and methods affect viewers’ experiences of her sculptures? Phenomenology is a diverse philosophical discourse united by an interest in the structures of subjective experience and the appearance of ‘phenomena’ to consciousness. Central to a number of key texts is the belief that the body is the site of perception and provides us with our ‘primary function’ of living and feeling the world.12 As a philosophical trend it comprises the work of a number of authors with varying ideas, but this study draws predominantly from the writings of Maurice Merleau-Ponty, whose influential book, Phenomenology of Perception, was published originally in Paris in 1945 and translated into English in 1962, making his theories, and the initial reception of his work, contemporary with Hepworth’s maturing career. Given the relatively late date of its translation, it is unlikely that Hepworth read Merleau-Ponty’s text and no references to the philosopher exist among the artist’s papers. This suggests that Hepworth was not aware of Merleau-Ponty’s specific contributions to philosophy and makes it unlikely that a causal relationship existed between the two. However, given the contemporaneity of Hepworth’s and Merleau-Ponty’s respective investigations into form and the nature of perception, it is perhaps possible that their ideas are to some extent socially, culturally and historically bound. Two articles on Hepworth’s work by the art writer E.H. Ramsden provide evidence of one of many potential ways in which Merleau-Ponty’s and Hepworth’s practices can be seen to converge. Although a number of excerpts from correspondence between Hepworth and Ramsden have been cited in existing literature on the artist, Ramsden’s perspective on Hepworth’s work is expressed most profoundly through her published texts.19 Importantly, Ramsden’s articles demonstrate a strong awareness of proto-phenomenological ideas, which she applied to a reading of Hepworth’s works. Ramsden does not explicitly discuss Merleau-Ponty’s ideas, but her articles strongly evoke contemporary philosophical and scientific changes in thought which can be said to have contributed to both Hepworth’s developing sculptural imagination and Merleau-Ponty’s descriptions of perception. Ramsden’s texts can therefore be used as a starting point for ascertaining the ways in which phenomenology might be used as an analytical framework with which to examine Hepworth’s developing engagement with the figure in the landscape. Nature is an inclusive term and the theoretic detachment of man is as arrogant as it is fallacious. But the recognition of man’s essential unity with the forms of the world brings another acknowledgment, no less inescapable … For if it be said that man’s perceptions of Nature are from within Nature, as they indisputably are, then it cannot be denied that his intellectual activities, whether scientific or otherwise, are equally a part of Nature and belong, no less than his instincts and his passions, to the totality we call life. As early as 1943, then, Ramsden connected Hepworth’s work to proto-phenomenological ideas in which a body-mind dualism was rejected and the notion of perception ‘from within Nature’ was brought to the fore. Hepworth seems to have appreciated this viewpoint, for in the summer of 1943 she wrote to Ramsden with praise: ‘I do like the thing you’ve written for Horizon.’27 Attempting to relate this philosophy to specific examples of Hepworth’s work, Ramsden emphasised Hepworth’s dependence upon scale, her sense of the figure’s response to the landscape and the relations expressed in sculptures with multiple parts. It was not until an article three years later, however, that Ramsden clarified her sense of the ways in which Hepworth’s work reflected contemporary philosophy. For Ramsden, the sculptor’s creation of a three-dimensional, ‘tangible’ work was upheld as having particular significance for contemporary society. She considered Hepworth’s works to be particularly exemplary of these trends because, she described, viewers were persistently aware that her abstract forms were ‘grounded in Nature’.36 This, Ramsden explained, rested ‘in no less a degree upon the sculptor’s instinctive and unfailing regard for the inherent possibilities of his material’.37 Hepworth’s sensitive approach to the intrinsic structure of materials was considered by Ramsden to be an important way in which Hepworth’s works recreated ‘patterns of experience’ and represented the processes of transforming ideas and feelings into form. Grouped under three categories, the means Ramsden described are useful starting points for an analysis of Hepworth’s work from a phenomenological perspective. First, by looking at Hepworth’s ‘interpenetrations of the material’ or the creation of more complex relations between form and space Hepworth’s development of the figure and landscape theme can be better understood. Secondly, Hepworth’s use of stringing can be seen as a symbol expressing the connectivity between the figure and the landscape. Finally, by considering ‘the inner tensions of the configured whole’, including ambiguities of form and variety of perspectives, Hepworth’s utilisation of the temporal nature of perception can be highlighted as a critical aspect of her work. As the art historian William Gibson explained in 1946, Hepworth would ‘speak not of an idea or a method … but of an emotional event, and of the fact that carvings of a certain type were done immediately afterwards’.46 Five years later Hepworth herself explained, ‘For a few years I became the object. I was the figure in the landscape and every sculpture contained to a greater or lesser degree the ever-changing forms and contours embodying my own response to a given position in that landscape’.47 Although in her language Hepworth often anthropomorphised the landscape in order to communicate the physical effect the view had on her, the form of Pelagos is not distinctly human. Like the view Hepworth described, Pelagos has ‘arms’ which enfold, but it is the relationship between these planes and the space contained inside which abstractly transcribe Hepworth’s sensation. Although produced for different purposes and to various specifications, the ways in which Hepworth was photographed with her sculptures indicate how she imagined the physical relationship between her works and the human figure. In most photographs where Hepworth posed with her works, she looks directly into them, makes physical contact with their inner forms or frames herself within their shapes. In a photograph with Oval Sculpture (Delos) 1955 (fig.2), which appeared in a catalogue in 1962, Hepworth rested her elbow on the sculpture’s ledge and stared up and into the work’s hollowed-out interior space, while in a photograph taken by Ida Kar in 1961, Hepworth leaned into Curved Form (Trevalgan) 1956 (fig.3), positioning her upper body within the space created by its two arms. She similarly positioned herself within the plaster of Oval Form (Trezion) 1961–3 (fig.4), stretching out her arms to interact with and inhabit its interior shapes. The progression shown in these images demonstrates the development of Hepworth’s work, which was afforded by her experimentation with bronze. From 1956 Hepworth began to devote a substantial portion of her practice to this medium, which allowed for a greater openness of form.52 From works such as Pelagos, with its inviting interior space, to Oval Form (Trezion), which Hepworth could physically reach inside, Hepworth’s work increased in size to the extent that her bronze structures became so large that viewers’ bodies could literally enter the works. For example, the viewer is invited to walk through Four-Square Walk Through 1966 (fig.5) and truly inhabit the structure, interact with its forms and other participants who enter the work. As early as 1937 Hepworth wrote about the importance of scale in her work. She explained, ‘Scale is not physical size … a very small thing can have good scale or a very large thing poor scale … Scale is connected with our whole life – perhaps it is even our whole intuitive capacity to feel life’.53 In 1967 she expanded that ‘This engagement helps to orientate us – give us an image of security and a sense of architecture’.54 Hepworth called her later structures, such as Four-Square (Walk Through), ‘full-scale’ works as they were planned in relation to the full dimensions of the human body. Hepworth emphasised, however, that even smaller works could have bodily scale and transcribe the sensation of being ‘held’ in the landscape. In 1966 she wrote, ‘Whenever I am embraced by land and seascape, I draw ideas for new sculpture: new forms to touch and walk round, new people to embrace, with an exactitude of form that those without sight can hold and realise’.55 In this statement Hepworth connected the tactile possibilities of sculpture to its social role – its ability to ‘embrace’ new people and be open to those even without sight. By applying her ideas about feeling embraced by the landscape Hepworth suggested that she could provide a protective, social and almost healing experience in which the body, whether physically touching the work or not, played a vital part. String is a symbol of interconnectivity. It is a fibrous substance made of entwined materials and used to tie things together, weave, carry, fish with a line, or physically surround things with a net. It serves as a connective tool, linking separate things and allowing people to operate in certain ways. Yet string as a device symbolic of connectivity is not the only way in which it contributes to the meaning of Hepworth’s works. String is a substance with particular properties which can themselves express meaning.56 Not just an abstract line, it evokes physical strength and tension. It exerts upon its viewer a sensation comparable to its own tautness, an increased sense of tension. Hepworth’s own word was that it transcribed a ‘pull’ she experienced when standing in the landscape.57 Merleau-Ponty explained how ‘the experience error’ is committed when perception is ‘made’ out of things perceived rather than things sensed.58 When dealing with sense experience, he particularly stressed that each quality of a substance has a ‘vital value’ or meaning which is grasped first by the body.59 Placed in parallel or weaved together, Hepworth’s strings often create patterns on which the eye can never rest and the movement of these sense organs has its own ‘perceptual significance’. This sense of vibrating unrest parallels the material’s own sensitivity to movement.60 It is telling that Hepworth often used string to compose the vibrating, sensitive surfaces of wings. 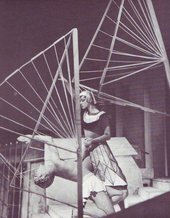 Hepworth made Stringed Figure (Curlew) (fig.6) in 1956, one year after designing winged costumes and props for the set of Michael Tippett’s production of The Midsummer Marriage (fig.7). Composed of similarly long, thin partitions of material painted bright white, these set designs induce a similar sense of vibrating activity. Steel rod, used by Hepworth from the beginning of the 1950s, has a similar effect to taut string. Apollo 1951 (fig.8) was created as a character for a production of Sophocles’s Electra directed by Michel St Denis in London that year. Most effectively seen in the context of the play, Apollo describes the vibrating energy of the god of light and the material’s tensile structure enabled Hepworth to produce an emphatically gestural, expressive shape suited to the work’s character role.61 Hepworth described how she was influenced by a sight of a figure within the landscape near St Ives, recalling how it became not only ‘a strong column, a thrust out of the land’ but also ‘a rising form which reaches outwards and upwards’.62 The reciprocity of perception and expression was a crucial concept to Merleau-Ponty, who said, ‘Insofar as I have hands, feet; a body, I sustain around me intentions which are not dependent on my decisions and which affect my surroundings in a way that I do not choose’.63 For him, as the body was constantly striving towards the world, seeking to know it, it continually expressed its co-existence and contributed meaning. A reciprocal relation was established with things perceived and categories of subject and object ceased to apply. Not only did Hepworth recognise an intuitive desire to approach and touch her sculptures but she also found the ways in which they had been touched important signals of the works’ effects. In Merleau-Ponty’s view, as perception entailed a physical intentionality towards things perceived, space was a ‘theatre of action’ in which one’s phenomenal body ‘surges towards objects to be grasped’.65 Hepworth’s works from this time represent her corporal and sensual responses to landscapes and they encourage viewers to respond in comparable ways. With this in mind, it is telling that, during the 1940s, Hepworth increasingly sought to locate works outside of the gallery space, preferring instead the surroundings of gardens or public spaces, where tactile, expressive reactions to her work would be more commonplace or acceptable. the visual field … and which breathe into it a secret and magic life by exerting here and there forces of distortion, contraction and expansion. Writing about Pendour 1947–8 (fig.10) Alex Potts observed that Hepworth’s works take on varying characters when they are seen from different viewpoints.69 He noted that Pendour looks solid from one side and hollow from another, depending on whether large cavities are in view. This was heightened, Potts explained, by the difference between colours painted onto the hollowed surfaces visible from either side: light blue on one and white on the other. For Hepworth, too, a sense of pleasure surrounds her discussions on the perception of forms ‘capable of infinite variation’. Significantly, in the above statement, she connected this pleasure to constructivist investigations into form, finding such means particularly relatable to the ‘rhythm of the landscape’ around West Penwithin Cornwall. It is in works such as Pelagos, Pendour and Corinthos, for instance, that Hepworth so successfully combined a constructivist instinct for variety of form with an increasingly corporal physicality. While it is possible that this development may have occurred without Hepworth’s relocation to St Ives in 1939, the artist’s strong sense of the importance of landscape experienced during this time cannot be ignored within discussions of her work. In 1949 Hepworth moved into Trewyn, the house, workshop and garden where she was able to create and to display works within a garden setting. 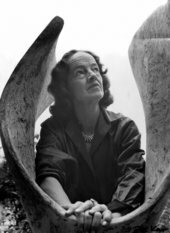 Under these circumstances, Hepworth was able to strengthen the connection between her works and the experiences of perception and organic forms. Visitors were encouraged to take the trip to Trewyn to experience the works in their ‘natural’ habitat. Yet Hepworth’s particular fondness for placing works in this environment was not simply a symbolic process of returning forms to the locations from where they were conceived. Rather, Hepworth’s choices were firmly rooted in her belief in the importance of variety and movement to the perceptual experience of form. At different points throughout her career, Hepworth had sited sculptures in outdoor locations. As curator Chris Stephens has recalled, two large works by Hepworth were placed in the Hampstead gardens (those of Hepworth and Roland Penrose) in the 1930s, and during the war Hepworth occasionally photographed her sculptures in front of the bay at St Ives.79 As Stephens noted, after the war ‘this dialogue between art work and nature came to the fore’ and Trewyn became the ‘principal location for this exchange’.80 In April 1943 Hepworth and Ramsden had a written conversation on this topic. Hepworth contested Ramsden’s dislike of a photograph of an earlier work entitled Single Form, which Hepworth had taken outside because, she wrote, ‘when I conceived Single Form it was born of this particular sort of landscape’. Her subsequent explanation suggests further motivations. While Hepworth recognised the potential ‘strength’ of gallery rooms, she stressed the variety of changeable, moving elements which she sought in outdoor locations, including the trees, air and clouds – features which would further contribute to her works’ varied forms, appearances and effects. Echoing her discussion of gestalt psychology, Hepworth consistently upheld the quality of ‘infinite variation’ in these displays. While her work remained rooted to the constructivist aesthetic, which she associated with the variety of impressions offered by a work, Hepworth sought to enhance a sense of her sculptures’ aliveness by displaying them in outdoor locations and integrating their structures with the fluid, changing substance of water. The central impulse of her works, therefore, remained the same. Sculpture was, for Hepworth, foremost a rhythmic, living force, embedded within the organic world and immovable from the tensions and processes of transformation implicit in nature and human experience. 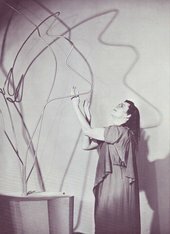 It is possible that it was Hepworth’s prolonged engagement with the figure in landscape theme that encouraged her own gradual acceptance of the role of the body – both her own and those of viewers – as the site of experience, and that the works she made after the Second World War reflect contemporary phenomenological concerns with the temporal aspects of perception and the bodily experience of meaning. Even if Hepworth never read the writings of Merleau-Ponty, phenomenology can offer a valuable critical perspective from which to discuss otherwise mute or aloof notions of interconnectivity and ‘in betweenness’, helping to express a coalescence of subject and object, body and environment, figure and landscape. 1. Maurice Merleau-Ponty, Phenomenology of Perception, 1945, trans. by Colin Smith, London 2002, p.178. 2. Barbara Hepworth, ‘A Sculptor’s Landscape’, in Drawings from a Sculptor’s Landscape, London 1966, p.11. 3. Barbara Hepworth, ‘Approach to Sculpture’, Studio, vol.132, no.643, October 1946, p.99. 5. Hepworth, ‘A Sculptor’s Landscape’, 1966, p.10. 7. Penelope Curtis, ‘The Landscape of Barbara Hepworth’, Sculpture Journal, vol.2, 1998, p.106. 8. Ibid., p.106. This view had been encouraged by a number of Hepworth’s own romanticised statements about Cornwall, including her well-known description of its ‘remarkable pagan landscape’ (see Barbara Hepworth: Carvings and Drawings, London 1952, unpaginated). The emergence of neo-romanticism in wartime and post-war Britain can certainly be related to Hepworth’s identification with prehistoric monuments in the Cornish Landscape, and to the ways she chose to describe this landscape in words. However, the qualities most closely associated with neo-romanticism – picturesqueness, linearity and visionary romanticism – are so antithetical to Hepworth’s abstract, physical forms that it would be inaccurate to identify it as one of the principal forces shaping her work. 9. Curtis 1998, p.106. 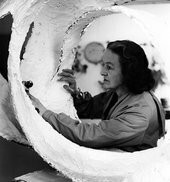 It is certainly true that Hepworth’s work from the mid-1940s suffers from a lack of easily identifiable critical perspectives which, for her earlier career, provide important interpretations of her practice. For example, art historian Anne Wagner’s perspective on works by Hepworth made in the 1930s drew significantly on the psychoanalytical ideas put forward by Melanie Klein and Adrian Stokes. See Anne M. Wagner, Mother Stone: The Vitality of Modern British Sculpture, New Haven and London 2005. 10. ‘The mark is not just the key point, the punctuation mark, but also the graffito or signature through which the sculptor marks not only the material, but even the landscape feature, as hers’ (Curtis 1998, p.110). 11. Barbara Hepworth, letter to Herbert Read, Herbert Read Archive, University of Victoria, British Columbia, Special Collections BH/HR 143, quoted in Curtis 1998, p.109. 12. For a more comprehensive introduction to the themes of phenomenological philosophy, see Michael Hammond, Jane Howarth and Russell Keat, Understanding Phenomenology, Oxford 1991. Hammond, Howarth and Keat particularly stress the theme of corporal perception in phenomenological discourse from Edmund Husserl’s early emphasis on the role of kinaesthetic experiences and corporal habituality in daily life. 13. G.W.F. Hegel, Phenomenology of Spirit, 1807, trans. by A.V. Miller, Oxford 1979. 14. David Hothersall, History of Psychology, New York and London 1995. 16. Hubert L. Dreyfus and Patricia A. Dreyfus, ‘Translators’ Introduction’ in Maurice Merleau-Ponty, Sense and Non-Sense, 1948, Evanston 1968, p.xii. 19. A monograph on Hepworth by Penelope Curtis includes a useful introduction to the relationship between Hepworth and Ramsden, and draws from some correspondence between the two. Penelope Curtis, Barbara Hepworth, 1998,London 2013. 20. E.H. Ramsden, ‘Barbara Hepworth: Sculptor’, Horizon, vol.7, no.42, June 1943, pp.418–22; ‘The Sculpture of Barbara Hepworth’, Polemic: A Magazine of Philosophy, Psychology and Aesthetics, no.5, September–October 1946, pp.33–4. 21. A letter from Hepworth to Ramsden dated 21 August 1944 mentions a recent visit. Tate Archive TGA 7714, uncatalogued collection. 22. Barbara Hepworth, letters to E.H. Ramsden, Tate Archive TGA 7714, uncatalogued collection. E.H. Ramsden, letters to Ben Nicholson, Tate Archive TGA 8717/1/2/3529–3645. 23. Hepworth particularly asked for suggestions of Greek words. In an undated letter presumed to be from 1943, Hepworth wrote to Ramsden: ‘I’ve been sitting up late at night trying to fix my catalogues & titles. I’m more than ever convinced that the right title is absolutely necessary to me. Can you help me? I’ve forgotten all my Greek now & haven’t a dictionary. I know the feeling & intention of each carving but the exact words are elusive & also I’m very fussy about names & words generally – say some of them often & they become silly – within music.’ Barbara Hepworth, letter to E.H. Ramsden, 1943 (dated by Sir Alan Bowness), Tate Archive TGA 7714, uncatalogued collection. See also Curtis 2013. 24. Ramsen 1943, p.418, original italics. 26. See, for example, C. Robert Mesle, Process-Relational Philosophy: An Introduction to Alfred North Whitehead,West Conschohocken and Edinburgh 2008. 27. Barbara Hepworth, letter to E.H. Ramsden, 1943 (dated by Sir Alan Bowness), Tate Archive TGA 7714, uncatalogued collection. 38. Barbara Hepworth, letter to E.H. Ramsden, October 1946 (dated by Sir Alan Bowness), Tate Archive TGA 7714, uncatalogued collection. 40. Barbara Hepworth, A Pictorial Autobiography, 1970, London 1985, p.49. 42. Barbara Hepworth, text written in 1951 for the catalogue of her 1954 retrospective at the Whitechapel Art Gallery, London, Tate Archive TGA 20132, uncatalogued collection. Parts of this manuscript are reproduced in Sophie Bowness (ed. ), Barbara Hepworth and the Yorkshire Landscape: An Anthology of her Writings and Recollections,Wakefield 2003. 45. Barbara Hepworth: Carvings and Drawings, 1952, unpaginated, quoted in Matthew Gale and Chris Stephens, Barbara Hepworth: Works in the Tate Collection and the Barbara Hepworth Museum, St Ives, London 2001, p.100. 46. William Gibson, Barbara Hepworth: Sculptress, London 1946, p.10. 47. Barbara Hepworth: Carvings and Drawings, 1952. Art historian A.M. Hammacher suggests that Hepworth’s statement was written in 1951. See A.M. Hammacher, Barbara Hepworth, 1968, trans. by James Brockway, London 1987, p.201. 48. Alex Potts, The Sculptural Imagination: Figurative, Modernist, Minimalist, New Haven and London 2000, p.158. 50. Both Jack Burnham and Alex Potts discuss this tension within Hepworth’s works but focus primarily on Hepworth’s lightening of interior surfaces with white paint. Burnham described how this created a sense of ‘interior immensity’ and ‘spatial dizziness that can result even from small spaces that lend themselves to sudden accessibility’. See Jack Burnham, Beyond Modern Sculpture, New York 1968, p.150, quoted in Potts 2000, p.158. 51. Hepworth, ‘A Sculptor’s Landscape’, 1966, p.13. 52. For more information on Hepworth’s use of bronze, see Sophie Bowness (ed. ), Barbara Hepworth: The Plasters: The Gift to Wakefield, Farnham and Wakefield 2011. 53. Barbara Hepworth, ‘Sculpture’, in J.L. Martin, Ben Nicholson and Naum Gabo (eds. ), Circle: International Survey of Constructive Art, London 1937, p.114. 54. Quoted in Edwin Mullins, ‘Scale and Monumentality: Notes and Conversations on the Recent Work of Barbara Hepworth’, Sculpture International, no.4, 1967, p.20. 55. Hepworth, ‘A Sculptor’s Landscape’, 1966, p.11. 56. I am indebted here to Tim Ingold’s emphasis on materiality and process in the field of cultural anthropology. See Tim Ingold, ‘On Weaving a Basket’, The Perception of the Environment: Essays on Livelihood, Dwelling and Skill, London and New York 2000, and Lines: A Brief History, Abingdon and New York 2007. 57. E.H. Ramsden, Sculpture: Theme and Variations, Towards a Contemporary Aesthetic, London 1963, p.42. 61. Apollo, the god of light, is frequently referred to in the play yet never appears as a human character. As Matthew Gale and Chris Stephens have suggested, the gestural quality of Apollo, a graphic exploration of space, is also comparable to Picasso’s torch drawings captured for Life magazine in 1950 by the photographer Gjon Mili. See Gale and Stephens 2001, p.122. 62. Contemporary British Sculpture, exhibition catalogue, Arts Council, London 1958, p.12, quoted in Gale and Stephens 2001, p.132. 64. Quoted in Mervyn Levy, ‘Barbara Hepworth – Impulse and Rhythm’, Studio Magazine, vol.164, no. 833, September 1962, p.91. 67. M.C. Dillon, Merleau-Ponty’s Ontology, Evanston 1998, p.170, quoted in Christopher Tilley, The Materiality of Stone, Oxford and New York 2004, p.19. 70. Barbara Hepworth, letter to Tate Gallery,19 July 1962, quoted in Gale and Stephens 2001, p.143. 75. In Phenomenology of Perception, Merleau-Ponty defined ambiguity as the opposite of Cartesian objects, which are ‘pure and absolute’. See ibid., p.13. 78. Hepworth, letter to Herbert Read, Herbert Read Archive,University of Victoria,British Columbia, Special Collections HR/BH 41, quoted in Curtis 1998, p.108. 79. Chris Stephens, ‘A Sort of Magic’, in Miranda Phillip and Chris Stephens (eds. ), Barbara Hepworth Sculpture Garden, London 2002, p.9. 81. Barbara Hepworth, letter to E.H. Ramsden, 28 April 1943, Tate Archive TGA 7714, uncatalogued collection. 82. Barbara Hepworth, letter to Charles Carter, 26 May 1965, Tate Archive TGA 965, uncatalogued collection. 83. Barbara Hepworth, letter to Charles Carter,19 October 1965, Tate Archive TGA 965, uncatalogued collection. A version of this paper was presented at a research seminar on Barbara Hepworth at Tate Britain on 28 March 2013. Rachel Smith is an AHRC-funded Collaborative Doctoral Student at Tate Britain and the University of York. Rachel Smith, ‘Figure and Landscape: Barbara Hepworth’s Phenomenology of Perception’, in Tate Papers, no.20, Autumn 2013, https://www.tate.org.uk/research/publications/tate-papers/20/figure-and-landscape-barbara-hepworths-phenomenology-of-perception, accessed 23 April 2019.